In the previous entry: "Editing Tasks" we walked through the process of allowing our users to update their own tasks. In this entry we will walk through a similar process, but this time allowing our users to delete tasks if they choose. Keep in mind that users can only edit and delete tasks which are their own. You probably guessed it already… and if you did that’s awesome… we will first create our stored procedure to delete tasks. The DELETE command is another command that you want to use with caution because depending on how you code it you can potentially delete a lot of data that you don’t want to delete. Delete statements also make use of the WHERE clause. So anytime you find yourself coding out a DELETE script be sure to proceed with caution. In the delete task procedure script above we, again, create the procedure name with a prefix then pass in a parameter of @TaskId because we only want to delete the task when the TaskId being passed in as the parameter equals the TaskId in the task table. This ensures that we will just delete one task. With our stored procedure correctly functioning we now need to create our DeleteTask Controller class. If you are picking up on our pattern of updating the stored procedure, then controller class, then web service, then the View control then you are learning and that’s good! Of course there’s no written rule that this is the order in which you have to create these. You can obviously create your files in whatever order makes most sense to you. As I think in a linear perspective this method best helps me keep things in line in my mind. In this method again we are using the “public void” because no data set is being returned. We pass in the parameter of taskId. Then we create an instance of the DataProvider and call the “ExecuteNonQuery” SQL method and to that method we pass in the string of the stored procedure we want to execute, which in this case is our “CBP_DeleteTask” method that we just created. We also pass in the taskId because the stored procedure is expecting this parameter. Here again we define a class for our data-transfer-object. This “TaskToDeleteDTO” will be an object that holds the taskId for the task that we want to delete. This data for this data-transfer-object will again come from our View.ascx. With the service method code again we include the security access level attribute, the ValidateAntiForgery token, and the request type declaration… this delete will be a POST request as well. 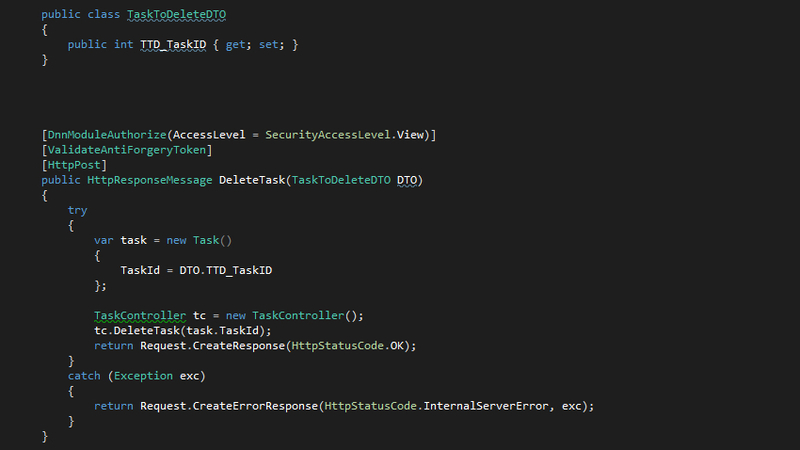 Then we create the HttpResponseMessage “DeleteTask” and into it we pass in the “TaskToDeleteDTO” object named DTO. Within the try/catch block we create a new task object and set the TaskID property. Next we create a new TaskController named “tc” and on that TaskController we call the “DeleteTask” controller method that we just created. Finally we return the HttpStatusCode of “ok” to complete our service code. In the catch block we log any exceptions in case that something does go wrong with our service. With all of our other components correctly configured we’re now ready to update the View.ascx file. This update will be fairly simple. Whenever a user clicks the “Edit” link we are currently showing them a cancel and a save button. We are going to update this and also add in a “delete” option. Here again we are using jQuery to find the specific DIV whose edit button was clicked and then we are appending cancel, save, and now delete options to it. Looking at this code we see that we are again using jQuery to find the unique ID of the delete button that got clicked. This way we’ll know which task should be deleted. We set this value to a variable called “DeleteClickedID”. Then you see something new… you see the $.dnnConfirm code block. If you think about it… we’re going to have our delete button very close to our save & cancel button. This is bad user interface design on my part... feel free to update yours as needed ;-) Since this may not be the best user interface a user may try to click save and accidentally click delete… and that wouldn’t be good... so we should probably update the UI, but we can take some steps to guard against accidental deletion and that’s exactly what that $.dnnConfirm is. Since we aim to guard against accidental deletion we can prompt the user to confirm that they do in fact want to delete the item they just clicked. Looking at the $.dnnConfirm text you see where we can define a few items in this block. We can tell the pop-up what text we want to present to the user, the “yes” action text, the “no” action text, the pop-up title, and finally the callbackTrue actions. In our code example you see where the callbackTrue option has a function defined and that function is where we call the deleteTask function and pass in the taskId of the item to be deleted. So we added one step in the deletion process, but it acts as a safeguard to our users. Beneath that we’re back to our same way of calling the service framework, but this time we just reference and updated url… the DeleteTask route of our service. Then once we delete the task, again we call our faithful loadTasks() function. We have indeed come a long way and I hope that you have learned some things, found this helpful, and been able to get your tasks module functioning correctly. Though we aren’t done just yet… we’ve got 1 or 2 more things we need to discuss and illustrate. We’re going to create a setting for our module. I hope to see you in the next blog entry! This is the most easy of all of this tutorial series so far. dnnConfirm only work when logged in as Host. I'm using version 7.4.1. Can you help me with this?